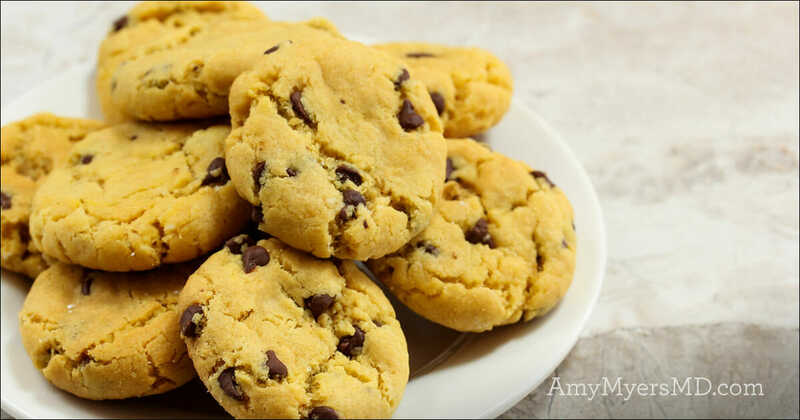 My Paleo Chocolate Chip Cookies are a wholesome treat that taste absolutely delicious! They have a soft, chewy texture and the perfect amount of natural sweetness, plus antioxidant-rich dark chocolate. Yet they?re baked without grains, dairy, or eggs! This recipe does contain maple syrup as a sweetener, so I recommend enjoying them after you?ve completed the reintroduction phase of my programs and are able to enjoy sweeteners on occasion. This healthy twist on the classic cookie is sure to be a hit with your family and friends! Preheat oven to 350 degrees F. In one bowl, combine vanilla, coconut oil, applesauce, and maple syrup. In a separate bowl, combine remaining ingredients except for chocolate chips. Add wet ingredients to dry ingredients. Then add chocolate chips. Line cookie sheet with parchment paper. Bake in oven for 12-14 minutes or until browned. Let sit for 5 minutes and move cookies to a cooling rack.